Mike has been the host/presenter for a ten-part series for Discovery (Weapon Masters), a five-part series for Channel 4 (Weapons That Made Britain) and a two-hour special for H2 (Going Medieval), for which he was also the writer. He was an on-screen pundit for the studio based series Time Commanders for the BBC. In addition he has been the featured contributor, leading the story, in a number of other productions, such a ‘Tournament – The Making of a Knight’ for Channel 4 and Discovery and Chariot Queen for the BBC. Mike wrote and presented this two-hour special for H2. 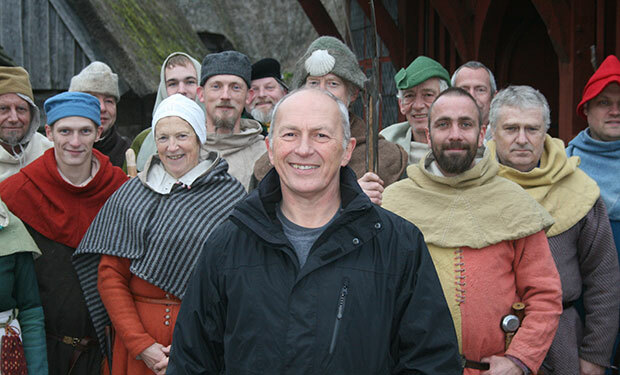 It is a hands-on exploration of the medieval period and breaks away from Mike just doing military topics, though there is plenty of that including a look at knights training, some unique longbow tests with 140lb bows, siege warfare – shooting through arrow-loops, escalade and trebuchets – and medieval gunpowder weapons. Mike was also able to look at a cross-section of town life and craft skills, to sail on medieval cogs and to travel on ambling horses. He had a leech put on him in a piece about medicine; he did laundry with medieval soaps and he sampled medieval cooking. He ploughed with oxen and rode with hounds in simulated hunting scenes and also flew falcons in a mounted falconry sequence. Going Medieval covered a rich mix of medieval life and often challenged modern ideas about the period. It was filmed on location at Guedelon castle, France, the Middeladlercentret, Denmark, and, in the UK at the Weald and Downland museum and in the New Forest. Mike was the co- host/presenter for this 10-part series for The Discovery Channel. Filmed in the USA, England, Germany, Denmark, Peru, Japan, China and India. 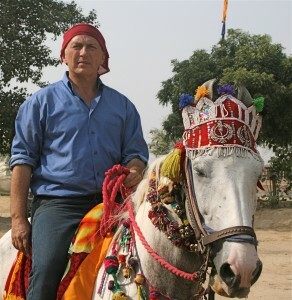 Each episode looked at a weapon from a different culture and time period and Mike travelled to various destinations to unearth the history, traditional manufacturing methods and systems of use for each weapon – challenging his co-host, Chad Houseknecht, to make an improved version using modern materials and ideas. In the process a lot was discovered about both the history and the science of each weapon. Mike wrote and presented the 5 x 60 minutes series Weapons That Made Britain for Channel 4. The series was produced by Lion Television. This ground-breaking series delivered a new way to bring history to the tv screen. It was never released on dvd but still has a huge cult following with hundreds of thousands of views for pirated versions on You Tube. In his unique hands-on style Mike demonstrated and tested all the weapons, including shooting a bow whilst on horseback at the gallop and doing a piece to camera at the same time, throwing himself off a horse in full armour and getting to his feet and engaging in numerous fights. Each programme told the story of a battle in which the weapon was used significantly. Mike also traced the history of the weapon and met with craftsmen to see how it was made. 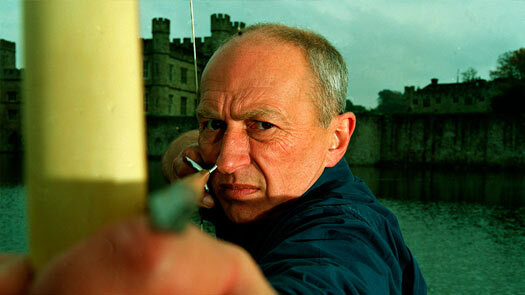 He took groups of young people, trained them in the use of the weapon and demonstrated how it would be used in battle. In addition he undertook scientific tests of each weapon’s potential at the Royal Military College of Science at Shrivenham.